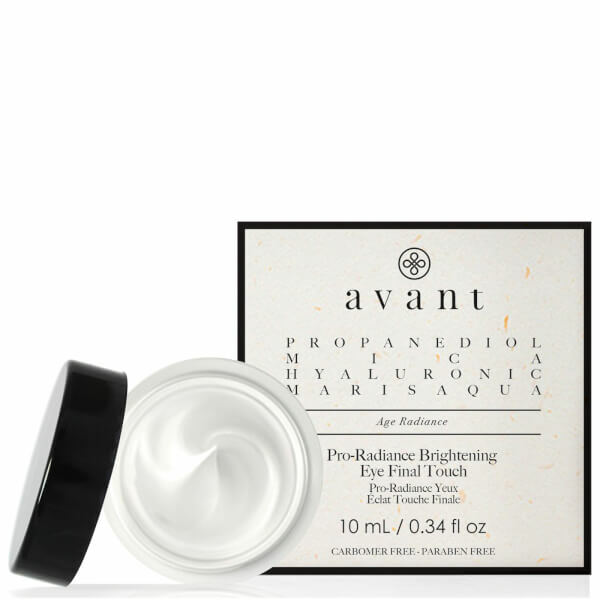 Diminish signs of ageing with Avant Skincare Pro-Radiance Brightening Eye Final Touch; a luxurious eye cream that combines nature with science for maximum efficacy. Infused with Hyaluronic Acid and Sea Water (packed with Magnesium, Potassium and Calcium), the weightless, quick-absorbing treatment delivers long-lasting moisture and hydration, whilst encouraging improved tone and elasticity. Working to combat common concerns, the innovative formula minimises the appearance of fine lines, wrinkles, dark circles and under-eye bags for a smoother, more refined eye area. A dose of light-reflecting Mica restores a youthful glow and leaves behind a shimmering finish. Apply in the morning and evening onto clean, dry skin around the eye area. Apply in a light tapping motion with the ring finger, which applies the least pressure to the delicate under-eye area.